► London Guildhall School of Music and Drama graduate Jodie Whittaker is among 106 women receiving the Freedom of the City of London. The ceremony takes place later in the year after the Court of Common Council puts the final seal of approval on the Freedoms. Writers Steven Moffat and Mark Gatiss 2019’s Comic Relief. Photo © Comic Relief. 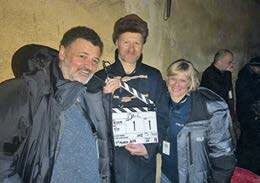 with producer Sue Vertue on location for Dracula on 4 March. Twitter photo © Mark Gatiss. 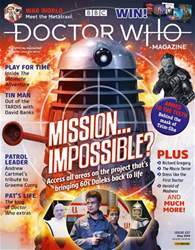 ► Radio Times guest editor David Walliams interviewed Tom Baker for the 6-22 March edition, celebrating children’s television. Tom MacRae is scripting the film adaptation of Andrew Lloyd Webber musical Sunset Boulevard, also working with him on a modern musical of Cinderella. Tom’s Everybody’s Talking About Jamie collected Best Original Cast Recording at the WhatsOnStage Awards on 3 March, with The Madness of George III, starring Mark Gatiss, bagging Best Play Revival and Best Supporting Actor in a Play (Adrian Scarborough).